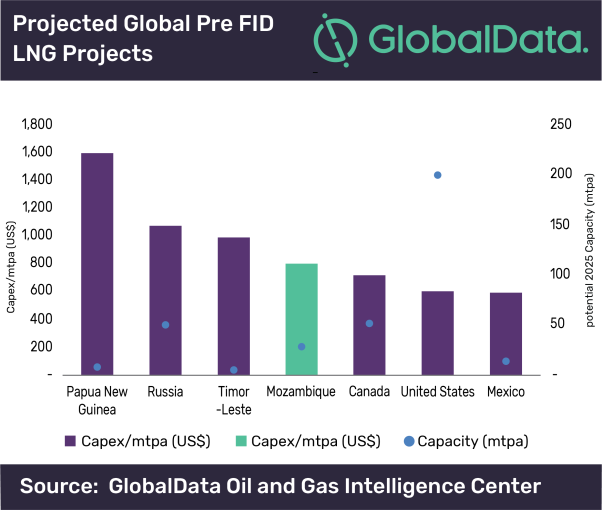 New gas sales and purchase agreements provide encouraging signs for Mozambique’s bid to become a top 10 global LNG supplier by the mid-2020s, according to GlobalData. The market intelligence firm predicts the country will bring online more than 30 million tonnes per annum (mtpa) over the next five years, placing it next to African rivals Nigeria and Algeria. Its oil and gas analyst Cao Chai said: “The development break-even gas price of around $4-5 (£3-4) per thousand cubic feet (mcf) for the onshore LNG projects in Mozambique is competitive compared to current Japan spot LNG prices of $9.24 (£7) per mcf. Can Mozambique become a top 10 global LNG supplier? Mozambique caught the oil and gas industry’s attention after it was found to harbour more than 125 trillion cubic feet (tcf) of natural gas reserves. “The advancement of LNG business in Mozambique will transform the country to a major global LNG supplier,” explained Mr Chai. “It will also bring direct revenue to Mozambique government and promote the growth of local industries through a domestic gas component of the initial project and follow-on expansions.